I received this radio only two days ago. So far, I’m pretty satisfied with the receiver. Nice feel to it, controls are solid, a joy to turn the knobs and the leatherette But I have to play with it more extensively to get a thorough idea of what it is capable of. And what it is not capable of….So far, the sync function is a mediocle affair, and I’m pretty sure it will not get any better. I’m used to the Sony ICF-2010/2001D so I’m spoiled. As for the sensitivity on medium wave and long wave, it desparately needs an external antenna. The Kaito AN-200 brings AM to life, the built-in antenna is not up to its task. Which is a shame because a portable radio must be self supporting as much as possible. I think Tecsun deliberately limits the sensitivity on AM/LW to avoid problems on short wave due to overloading. Overall verdict: a very nice portable with lots of features, be it the synchronous detector is quite useless. It produces a lot of static as the signal fades out. AM and LW are only mediocre and more to complete the package. Not for serious DX-ing. However, if the AN-200 antenna is used the reception is acceptable, but never suitable for DX-ing on AM. Dynamic range on AM/LW is rather poor, even strong signals are never without some noise. Great band for the buck, this radio. Great sensitivity. Works best outdoors with short wire antenna….does not need much length, more than 15 feet may overload it depending on the stations in your area. The only thing I dont like about the 880 is the digital side band processor. it is very distorted. Am and Fm sound amazing! Having compared the 880 Sync -Lock with that of my ancient Sony 2010D I think a large part of the problem is the 4.0 khz bandwidth that it uses. I would like to see the firmware upgraded to add a 6.5 khz bandwidth on both SSB and AM – specifically for the Sync Lock but also because I think 6.5 khz is the ‘sweet spot’ for SW listening; narrow enough to get rid of most adjacent station interference and wide enough for decent fidelity. Small correction for above comment, it was LSB, not USB. 🙂 Tecsun put LSB on the right, a convention that confused me. It may take someone knowing a lot more than me to confirm or deny this, but I think maybe people are misjudging the sync lock. If it’s being used for SSB with voice, maybe it’s no better than fine tuning without it, but during some early tests I found a USB broadcast of a rapid FSK digital signal on 2817 MHz. It warbles most musically without the sync lock, but with it, it had a hard digital precision (more square wave than sine) that was almost immune to some wide variations in antenna quality or signal strength, and to a lesser extent immune to noise and fading, and to limited but useful extent, to tuning frequency as well. The sync lock may be extremely potent when receiving weather faxes and the like, especially at sea in rough conditions. Gee… I was thinking of getting rid of my PL-660 because of the poor performance of the SYNC detector, and now this test says the PL-880 is even worse in that respect. You are in the vast minority if you believe the sync on the 660 is that bad. Most if not all other user reviews I’ve reviewed indicate it works very well on this radio. I bet the sync was a feature they were trying to implement through tricks that ended up not working. I am confident it does not have the circuitry necessary to make a good sync and that is why they don’t advertise it. if they did the complaints could kill off the radio. But – why hide SYNC? Why not advertise the feature? Was it a last minute addition? So, here is another strange twist: it is hidden in the manual as well – open the manual in adobe acrobat, search for “sync”, and what happens is a blank area of the LCD screen diagram (in the actual position of the sync indicator) is highlighted. The text “sync” is there, but *hidden*, in white!! Why hide sync? 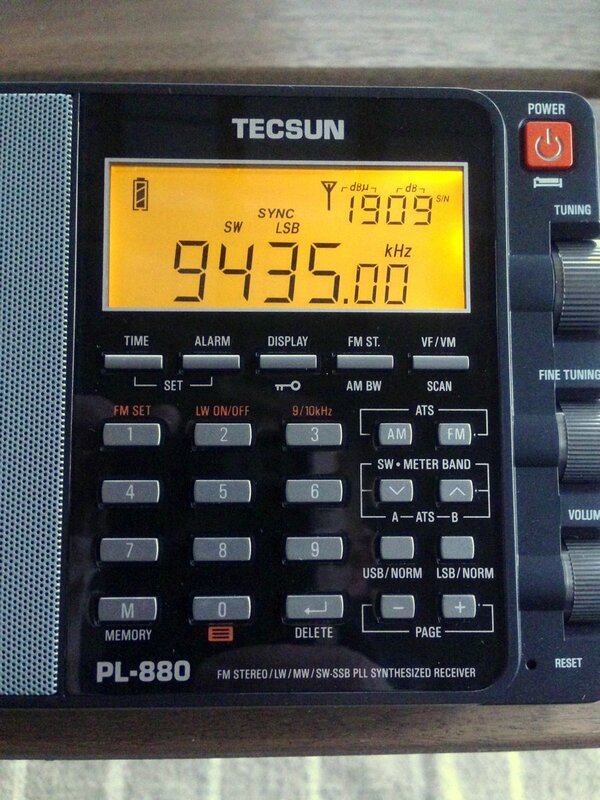 While the PL-880 has a sync detector, it’s not the best in the world. I think the PL-660 make a stronger sync lock on weaker signals. That’s certainly no deal killer for me, though, as SSB fine tuning is so good you can easily use ECR instead of sync. I want to get this one for sure, especially if it performs better than the PL-660 (which is already my favorite radio by far). With DSP, Sync detection, and excellent sensitivity, this is pretty sure to be an instant buy. I’m waiting on the reviews to surface before committed money towards the PL-880, but with what I’ve seen so far…I’m sold on getting one. Wow! I’m really excited by the sync detector! Great discovery. I’m hoping you have some updates for us soon on how effective it is. I’m also pleased that it shows the 10Hz resolution of the tuner on the display. The Grundig G6 had a 20Hz tuning step but only displayed the frequency to the nearest 1000 Hz. I’d also love to see a comparison between this and the 909x. Spec-wise, it looks like it is what the 909x should have been. Press and hold 9 when you listen to AM or SSB, you may adjust the muting threshold using either tuning knob. Press 9 again after you are done, the new threshold will be saved. The unboxing pictures showed a “SW ANT”. Can you test and confirm that, unlike the PL-660, this bad boy does not use external antenna for FM? Bellro; its 99.999% sure the radio uses the same antenna for SW and FM. Its also safe to say it uses a ferrite antenne inside the box for AM/LW. If you really need separate antennas for FM and shortwave, you can surely modify the radio. The FM and SW has separate input circuits, joined at the antenna. Hi! Congrats for the new toy! My two short questions: about the volume…it has analog, conventional potentiometer or the volume is by steps?…if yes, does it has annoying jumps from zero to loud volume as other Tecsun´s models? (I would like to use it at very low volume without earbuds). Second: what about the sound quality? According to the specs, the 880 has the same inch and half speaker as the Meloson 7/8, as well as some of the newer Tecsun FM only radios. Do they sound any different (provided you have a Meloson handy)?